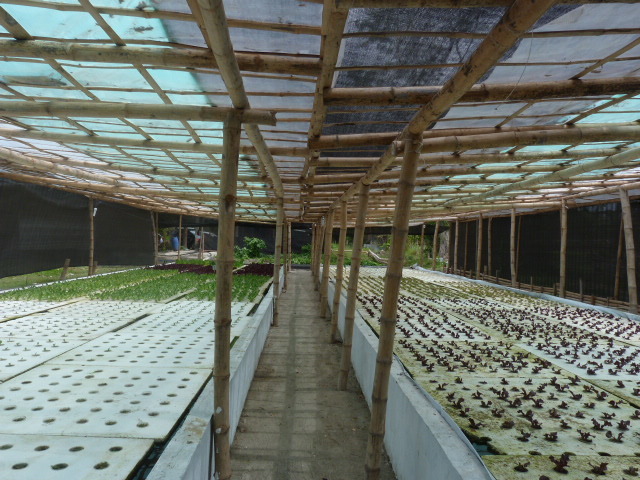 We have been in search for commercial aquaponics setups here in the Philippines to be able to share it with you, our readers, and spur awareness on how aquaponics technology might be a good alternative to growing vegetables and fish especially in times of extreme weather and drought which impacts food production using conventional farming. 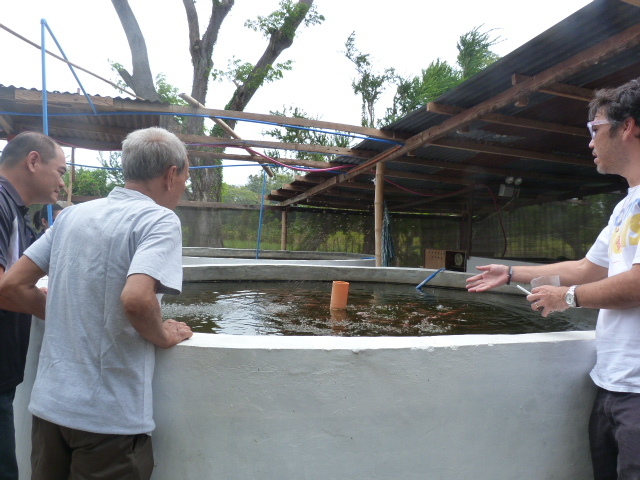 Two of the setups we visited earlier this year (2014) are; Bay Aquaponics in Laguna and La Estrella Farms in Calatagan. 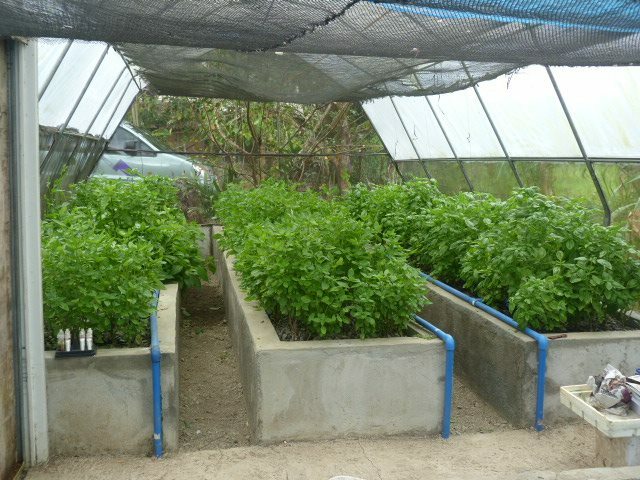 Bay Aquaponics is owned by Akim Vergara of Bay, Laguna. It is located approximately 1.5 hours travel from Manila. In around 100+ square meters system, they grow lettuce in rafts, while basil, ashitaba and mint grow in media beds with gravels. The media beds also serve as filtration for the recirculating water in the fish tank with koi fish as producer of nutrients for the plants. Since the setup is made of cement beds and tanks, the challenge with Bay Aquaponics setup is how to bring down the pH level as lye from the cement shoots up the pH. To slightly acidify the system and meet the pH level they are targeting for lettuce production, they use pineapple scraps submerged in the fish tank water. Laguna is known for pineapple production, so getting pineapple scraps from a nearby market for free is not a problem. Akim also shared that submersion of basil trimmings and malunggay leaves in the fish tank are additional sources of organic nutrients for healthier plant growth. Malunggay production, by the way, is another business Akim is into. He sells the basil and lettuce harvest for a premium price at a nearby restaurant in Bay, Laguna. Bay Aquaponics gravel beds growing basil, mint and ashitaba. Nursery and a raft with growing lettuce. The travel time to La Estrella Farms (LEF) in Calatagan is approximately three hours from Manila. We stopped at the Bag of Beans in Tagaytay, where we met AP enthusiasts for a convoy drive to Nasugbu. 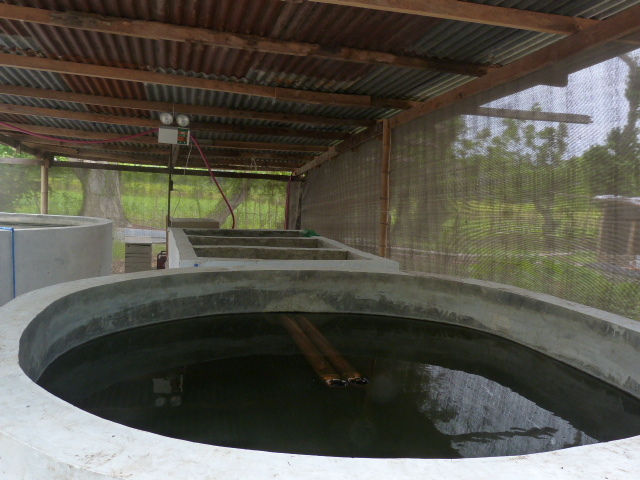 The last two kilometers of the journey is rough, but the excitement to see a semi-UVI aquaponics system was not a deterrent to the group. We were by no means going to be lost even if we do not know the exact address as the farm owner Chris Guidotti guided us in going to LEF aquaponics site. The aquaponics system is with six fish tanks rearing 12,000 red tilapias and two rafts growing 5,000 lettuce heads of different varieties. 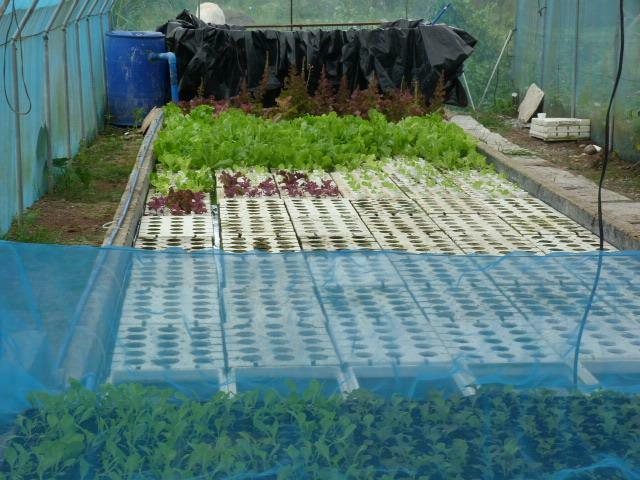 Each raft has 120 square meters of growing area with 2,500 lettuce heads, while each fish tank has 2,000 red tilapias with approximately 1.5 meters depth and 3 meters diameter. LEF is not applying pesticide or any additional organic or inorganic fertilizer in growing their lettuce. Plant nutrients come purely from fish and freshwater prawn poops. On marketing, LEF sell their produce at a niche market in Ayala, Alabang. Friends also call in advance to reserve fresh lettuce they harvest weekly. There are times that harvest would not suffice, Chris shared. Backups of pumps and aerators are a necessity. You also need a generator in case of brown-outs. In fact, in order not to risks the lives of red tilapias they are growing at LEF, Chris secured two generators to ensure a ready power source is always on a stand-by. In the rafts they grow ulang or freshwater shrimps. Ulang act as bottom feeders and aid in cleaning the rafts. However, when it was added about a month ago, the entire water from the jar of ulang was dumped into the raft. After a week, they noticed stunted plant growth. Unknowingly together with the ulang, there were black tilapia fries dumped as well and have since been eating the roots. After removing the tilapias that has already grown into fingerlings, the plants recovered. As of this time, La Estrella Farms is still in the experimentation stage on aquaponics farming, but based on their sales of lettuce produce, Chris is optimistic for a return of investment after two years. They also plan on harvesting some of the red tilapias in the next few weeks. Here are pictures taken during our visit at LEF. 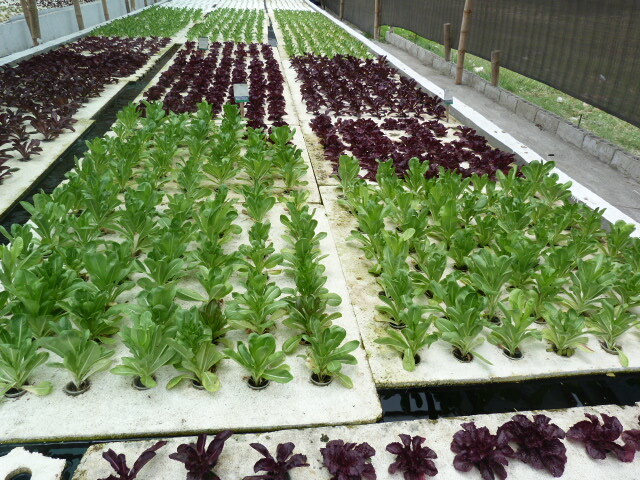 LEF is growing lettuce mainly using raft or deep water culture (DWC). LEF has 2 rafts growing 5,000 lettuce heads with total growing area of 240 square meters. 500 lettuce heads are harvested weekly. Chris explaining with the group how the fish tanks were setup and density of fish being grown at LEF. 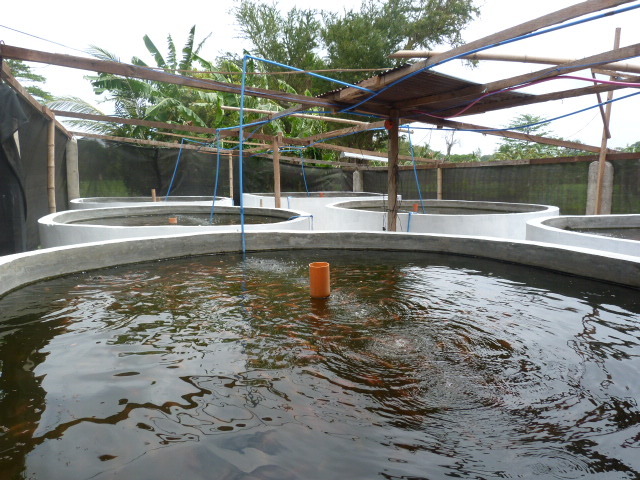 6 fish tanks housing 12,000 red tilapias. Each has 1.5 meters depth and a diameter of 3 meters. Aquaponics is a promising technology given the advantages that it brings, such as; not dependent on arable soil, the system uses 10% or less water, plant nutrient is supplied by fish feed/poop used for growing fish, it can be designed with raised plant beds which is easier to tend than conventional farming, no weeding is needed, some plants grow well on aquaponics compared to soil-based farming. However, also consider disadvantages such as; huge initial investment for commercial size setups, and in the Philippines the high cost of energy in running pumps and aerators is a constraint in going into commercial aquaponics. Albeit, to end on a positive note, with the development of free energy sources today, we are hopeful that aquaponics will be a viable solution to food security and sustainable agriculture in the near future. Let us continue exploring aquaponics.